Cover pencils by Curt Swan, inks by Murphy Anderson. 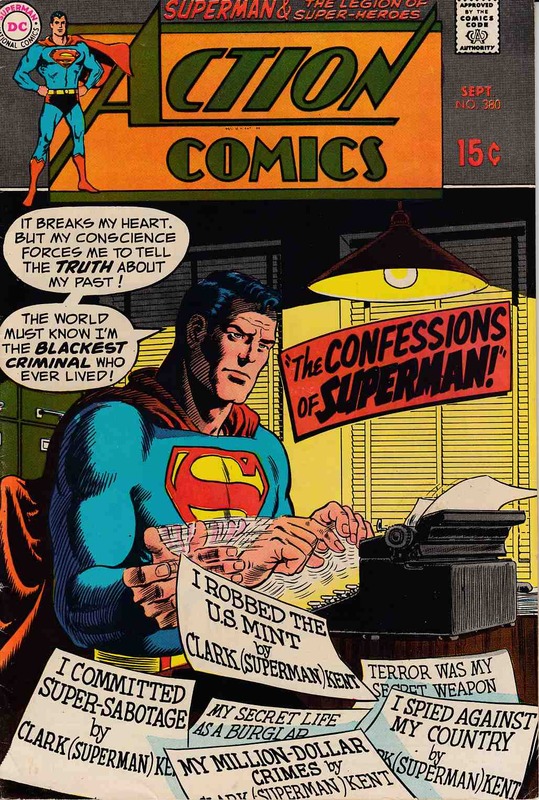 "The Confessions of Superman," script by Leo Dorfman, pencils by Curt Swan, inks by George Roussos; The Superman Revenge Squad sends two agents to defeat Superman, which they do by framing him for crimes against the United States; Due to the influence of Red Kryptonite, Superman is convinced that he is responsible for the crimes. Tales of the Legion of Super-Heroes back-up, "Half a Legionnaire? ", script by Jim Shooter, pencils by Win Mortimer, inks by Jack Abel; When Duo Damsel sends just one of her selves on an extended mission, it seems to return with its own personality, but it is really just the result of proximity to the power of the hero she met on the mission; Appearances by the Duo Damsel, Bouncing Boy, Mon-El, and Nam'Lor.